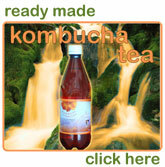 Your source of starter cultures / kombucha cultures / fungus / mushroom in Australia. I am located in Tropical Darwin Northern Territory where the weather is always warm and the conditions are perfect for growing Kombucha cultures quickly without the aid of heating pads. To make Kombucha cultures available in Australia and Worldwide I have searched for the cheapest and most efficient way to ship the Kombucha starters to get them to you as cheap, quickly and safely as possible. Since internet buying has become more popular, worldwide shipping costs have come down in price which makes it possible to post Kombucha cultures worldwide at a good price. However, with the bottled Kombucha Tea, I have shopped around for a cheap Australian Courier and have not been able to find one that can ship the bottles for a reasonable price. So I am once again limited to the 15 x 750 ml bottles of Kombucha Tea into a box. This service is only available to Australian customers.